A Gemini woman is a complex woman indeed. Known as “the twins”, this air sign goes wherever the strong wind takes her. Her mood can change as quickly as the weather, making her a mysterious and enjoyable person to get to know. Get ready for variety! This zodiac sign of duality has an elaborate personality, possessing the ability to be charming and spontaneous one minute, and then timid and withdrawn the next. There is never a dull moment with this woman, who loves to engage in discussions of every topic imaginable in a sharp, witty fashion. The interests of Gemini women are wide and diverse, allowing them to talk to anyone they come across about a myriad of topics. And because of this desire for knowledge, she is always traveling from one place to the next, looking for new and exciting subjects to add to her repertoire. This combination of intelligence, communication and a thirst for life makes the Gemini female a great candidate for jobs that involve traveling and problem-solving. Always up for a challenge, she meets any diversity head-on with a grace and style that would impress the most difficult of clients. She possesses a creativity that extends beyond artistic ability and flows into every faction of her life. The Gemini lady’s curiosity allows her to keep an open mind, although this can make her indecisive when it comes to choosing one solution. Her strength is throwing out ideas and moving onto the next problem. However, since she can’t stand still this makes changing venues very easy. And just as often as she collects new ideas, she collects new friends as well. Being as open and accepting as she is, she can get along with an array of characters. She is generous with her time and will focus on you intensely, until a new distraction grabs her attention and then it’s on to the next adventure. This may seem insensitive at first, but even her free spirit can’t keep her from returning to her good friends to strengthen the bond in a new way. 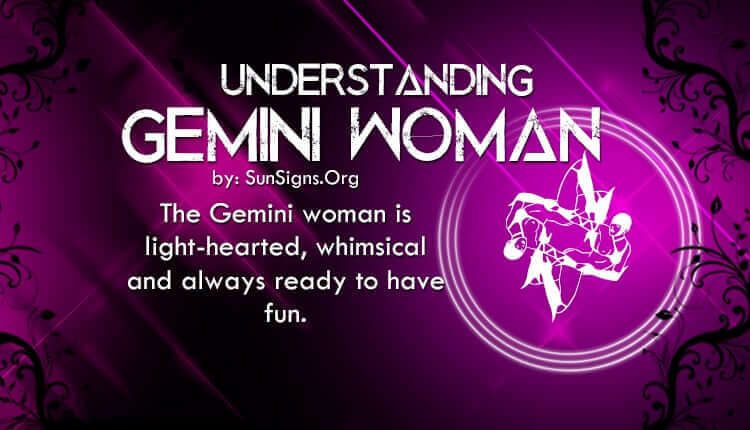 The Gemini woman is light-hearted, whimsical, and always ready to have fun, which makes her an irresistible force of nature. It might be difficult to keep up with her, but she will always reach back to help you along the way. This means that any man looking to date a Gemini woman will have a lot to deal with, as she will constantly be moving from one project to the next. But if you are up to the task, the rewards will be plentiful. Her youthful exuberance suggests she is not interested in planting roots, so her lover will have to be flexible on all fronts. However, if he remains a bit of a mystery to her she will want to stick around to solve the puzzle (just as long as he accepts that she too, will most likely remain a puzzle with her mood swings). But this level of excitement is perfect for adventurous lovers who want to try new things, and the Gemini woman is up for it all. She is generous, flexible, and welcoming of the challenge. Even though she may be difficult to tame, you wouldn’t want to do that anyway. Her desire to push the envelope in every aspect of her life leads to breathtaking moments that will keep you coming back for more.